For some families, music is light entertainment. A radio may play softly in the background during dinner or Sunday chores, and the instruments get dusted off monthly at a backyard pā‘ina. But for others, music is an absolute necessity — a daily ritual. It is history and storytelling. It is expression. It is joy, sadness, pain, comfort, healing. It is land and it is people. It is life. Such was the case for Victoria Keali‘ika‘apunihonua Ii Rodrigues. Born in 1912 to a deeply musical ‘ohana of talented singers and composers, Aunty Vickie was groomed to master her craft with training beginning at the age of three. 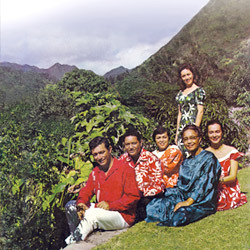 Raised by paternal grandparents James Kaihiihikapuokalani Ii and Katherine Lahilahi Stevens Ii, she was carefully taught the songs of Hawai‘i — their lyrics, meanings, composers, and backstories. Whichever family member was teaching her would sing a song three times through. The fourth time, she would join in. By the fifth, the young Vickie would sing alone, an entire song freshly committed to memory and tested for perfection. Many of the songs taught to Aunty Vickie were classics, well known and often enjoyed by the masses. A good number of them, however, were private family songs — personal accounts of equally personal events that, up until that point, were practically unknown to the general public. With a highly refined memory as her lone tool, Aunty Vickie became a walking repository of song and history and an invaluable resource for lovers of Hawaiian music. It wasn’t until 1949, at the encouragement of a dear friend, that Aunty Vickie began writing down the words and music to these songs so that they would not be lost to her children. In so doing, she created an incomparable archive of mele and saved a number of beloved ancestral treasures from near extinction. KFVE viewing: Spectrum subscribers may tune into channel 1022/22, Hawaiian Telcom subscribers may tune into channel 1013/13. Louise Aoe McGregor Award recognizes the student director who has made the most significant contribution to the class in organizational ability, leadership, assistance to others and persistence. Richard Lyman, Jr., ‘Ōlelo Makuahine Award recognizes excellence in the use of the Hawaiian language within a song. George Alanson Andrus Cup is awarded to the winner of the men's competition. New England Mother's Cup is awarded to the winner of the women's competition. Helen Desha Beamer Award recognizes the best musical performance. Charles E. King Cup is awarded to the winner of the combined class competition. A group of Kamehameha Schools Kapālama students recently took a collection of original songs to the worldwide stage, bringing their talent to life through an innovative music compilation project. The result was a 17-track album titled “Untold” created solely by students, from performances to production. The “Untold” CD is available for purchase at Kamehameha Schools Kapālama campus bookstore, as well as through musictech.hearnow.com. “Untold” is also available to stream on iTunes, Apple Music, Spotify, Pandora, YouTube and Amazon. Revenue from the sales of the CD will support future projects like this one undertaken by KS Kapālama’s Music and Technology class. Questions, comments or feedback? We would love to hear from you.